Hackaday.io user [Walker Eric] is an RC airplane enthusiast who wanted to record his plane flights autonomously, without the need of a 3rd hand or having to ask a friend to stand by for this purpose. The flying target should ideally be in the center of the camera field of view. For this purpose he designed a nice video-tracking system composed of a small LiPo powered Moteino+GPS unit that is mounted on the moving target (the RC plane). This reports frequent GPS positioning to the base receiver unit which controls a video camera movement via motors and follows the fast moving RC airplane. He has managed to produce a really good prototype and has even submitted this as a 2015 Hackaday Prize entry. Zooming is desirable and it’s one of the features he is still working on. Overall this was a great project that Eric has shared with me and I’m quite happy that the Moteinos involved can handle the GPS coordinate transmission between the moving airplane and the base station. 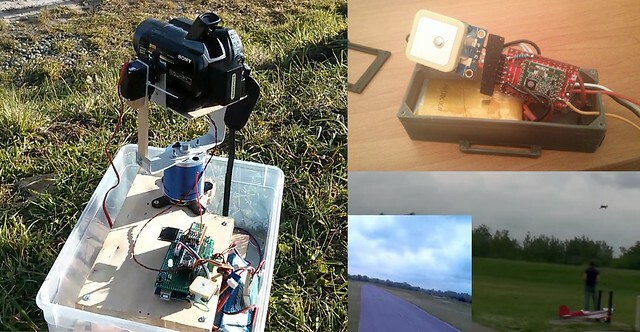 This project could of course be used to autonomously record video of other types of RC moving objects. I can also think of people who want to film themselves doing some activity or record a moving object/animal etc. Check out his project page for more videos, photos and details of the build, and give him a skull!